Recently I had a friend who shared that she recycles orange peels into this awesome cleaner. 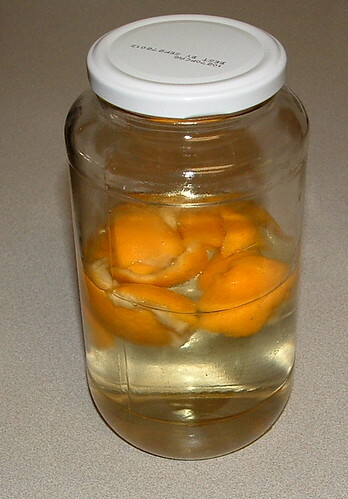 You just add some white vinegar to a jar with some orange peels and let it set for about a week or two. Here is my mix with peelings from just one orange and about two cups of vinegar. Just shake the jar a few times as it sits and the vinegar begins to absorb the citrus from the orange peelings. The vinegar will turn a tint of orange after about a week or so. You can add it to a spray bottle and use it to clean counters, bathroom surfaces, sinks, toilets, and floors. This homemade cleaner has a wonderful citric smell and leaves everything clean and smelling great. Sounds like a great idea to try! I am making a different kind of citrus cleaner, with yeast and sugar (let sit for two weeks), which works wonders. my sister’s housecleaner uses nothing but white vinegar to clean her house and it just sparkles and the vinegar odor vanishes within hours.